The last D-stock service, complete with commemorative stickers enters Dagenham East on the last day 21 April, 2017. 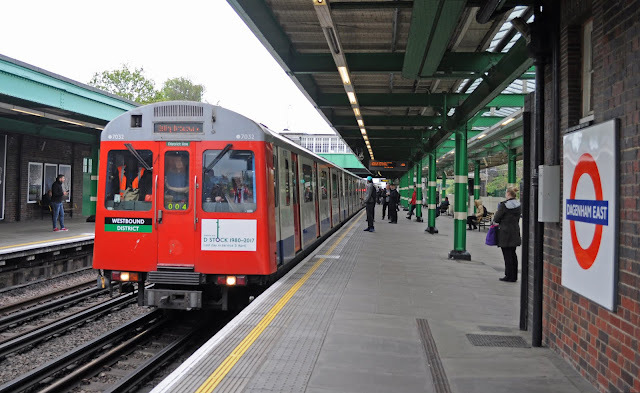 On Friday 21st April District line D-stock made it's last public run. Entering service from 1980 the 'D78' tubes replaced pre-war CO/CP and post war R stock. Originally delivered in unpainted aluminium the D stock trains served on the District line (and for a brief period the East London Line) serving destinations from Ealing Broadway, Richmond, Kensington Olympia and Wimbledon through to Upminster (Due to platform lengths C-stock was used on the branch to Edgeware Road). The D-stock will be remembered for being the last of the London Underground fleet to be painted into the corporate white red and blue livery upon its refurbishment from 2005-8. At the same time the trains lost their wooden floors and distinctive hanging grab straps. The trains also became the first on the underground to feature dot-matrix LED destination displays. passing at Whitchapel on 14th September 2007. The mid-life refurbishment could have seen the trains last another 20 years in service, however the decision was taken that all sub-surface stock would be replaced with a uniform fleet of new Bombadier S-stock. 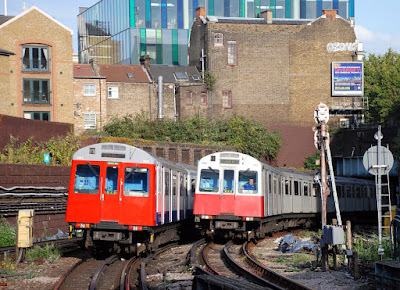 Following replacement of A-stock on the Metropolitan and C-stock on the Circle, District (Edgeware Road branch) and Hammersmith & City Lines it was time for the D-stock to take it's turn to bow out of service with withdrawals starting in January 2015. The final run public, the 16:35 from Upminster to Ealing Broadway was well patronised with enthusiasts, locals the press and of course commuters wanting to pay their farewells to this London workhorse. A railtour on 7th May will mark the last use of D78 stock on the London Underground, however some may yet live on as part of the Viva Rail class 230 'D Train' project to create a low cost DMU for branch line service.